A novel dissolving heart stent developed by Abbott Laboratories proved comparably safe and effective as its market-leading Xience stent in a large, late-stage trial that will be used to seek U.S. approval of the device, according to data presented at a medical meeting on Monday. 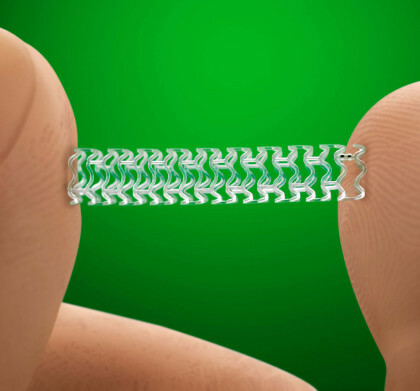 The bioabsorbable Absorb stent succeeded in demonstrating non-inferiority to Xience up to one year after implantation in the 2,008-patient study called Absorb III, researchers at the Transcatheter Cardiovascular Therapeutics meeting in San Francisco reported. The primary data point measuring target lesion failure, a combination of heart disease-related death, heart attacks associated with the treated blood vessel and need for repeat procedures in the treated area, occurred in 7.8 percent of Absorb patients versus 6.1 percent for Xience. The difference was not deemed statistically significant, researchers said. On a variety of secondary measures, Xience also appeared to be numerically better at one year, but with no statistically significant differences. “The trial met all its major endpoints, and given all the attributes my opinion is that it should be approvable,” Dr. Gregg Stone, global chairman of the study, said in an interview. Absorb is already used in more than 100 countries. Researchers believe advantages of Absorb will reveal themselves over time once it has fully dissolved. Patients in the trial will be followed for at least five years. “We’ve got good reason to be very hopeful that the long-term outcomes for patients will be improved with this device compared with a normal metallic drug-eluting stent,” Stone said. Stents are tiny tubes used to prop open arteries cleared of blockages. They are coated with drugs that help prevent reclogging. Absorb, which is made of a plastic similar to that used in dissolving sutures, is designed to fully disappear by three years after implantation, returning the treated blood vessel to its natural, flexible state. That is in contrast to the just-approved Synergy stent from Boston Scientific, in which the polymer coating used to deliver the drug disappears over time, leaving a bare metal stent in place. Stone said it will take some time for doctors to learn how to use the new device, which is a bit larger and softer than traditional metal stents.